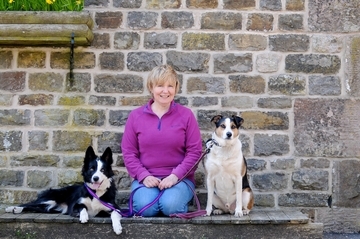 About us at Churnet Valley Dog Training, Staffordshire. I have recently qualified as a Kennel Club Accredited Instructor in Companion Dog Training. This means I have been assessed against a high standard by the Kennel Club that means I am able to provide a high standard of service in dog training. I abide by a code of conduct and only suitable methods of training which are motivational, kind, fair and always with the dogs welfare in mind. Churnet valley dog training was established in 2008, when my friend Elaine retired from dog training she asked if I would like to take over from her. 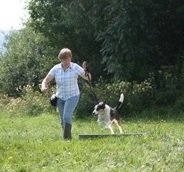 I jumped at the chance of running my own classes and Churnet Valley dog training was born. I'v always had a dog in my life, they know so much about us and give us so much, I believe we such take the time to learn about them, how to communicate with them, learn about their body language, what makes them happy, what upsets them, what they need. Once you understand the dog that knowledge will do so much for the relationship between you and your dog. I enjoy going to fun dog shows with my own dog, I am not very competitive but if there is a fun obedience class I will enter it. I love to organize fun dog shows for everyone to come along and have a lovely day out with their dog. I have a Compass education diploma in Canine Behavior and Psychology achieving a distinction. I have a Advanced Diploma in canine behavioral management. I have passed a behaviour modification practical course at the IABTC with a distinction. I have attended a course and have a certificate from the Derbyshire Canine Center on the subject of instructing dog owners in the positive reinforcement and behavioral method of training. I am constantly studying and attending courses to keep up my education so I can do the very best for my clients. I can show you lots of fun and interesting activities to do with dog, for example how to get your dog to find things for you, how to track with your dog, how to get your dog to retrieve and other things you and your dog will enjoy. It's a lovely job and very rewarding especially when I see smiley faces and wagging tails. I specialize in pet dog training but my real passion is behavior modification. I love to work with people who have problems with their dog. I do this with empathy and patience. I have a recently taken on a rescue dog who has many problems and am working though them with her. My experience with training classes means I have seen 100's of different dogs who all have their individual traits and training challenges. This also gives the practical experience me to help people to overcome and improve their problems with their dogs, as well as my formal qualification. 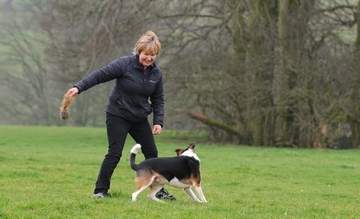 I travel around Staffordshire and Derbyshire to help people to train their dogs on a one to one basis.